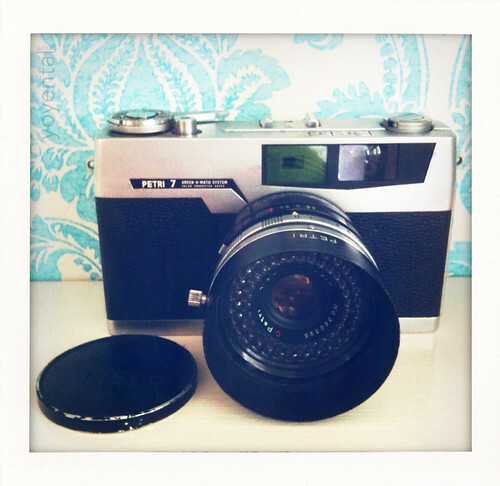 The Petri 7 is a fixed-lens 35mm rangefinder camera made by Petri/Kuribayashi in 1961. It replaced the Color Super series of rangefinders (and like them includes the phrase 'color corrected super' in the main badge). In style, the camera closely resembles the Canonet of the same year, but is somewhat more basic in its features (it has match-needle exposure control, rather than the Canonet's auto-exposure). It has a coated 45mm lens, available as an f/2.8 or f/1.8; these are presumably similar to the lenses on the Color Super cameras; a Tessar-type f/2.8 and a six-element f/1.8. The lens is set in a leaf shutter, giving speeds from 1 to 1/500 second, plus 'B'. This is synchronised for flash, with a switch on the lens barrel to select between X and M synchronisation. There is also a PC socket on the lens barrel, and a cold shoe. The shutter release button is threaded for a cable release. The manual claims the release needs only very light pressure, helping to avoid camera shake. The camera has a selenium meter, with the sensor arranged as a ring around the front of the lens (Petri call this arrangement the Circle-Eye), and with the meter reading shown in the viewfinder as a match-needle display. The meter's range is Light Value 7 to 17 at 100 ASA. The rangefinder is combined with the viewfinder. It has a rather short baseline (i.e. the VF and RF windows are rather close together). The RF spot is tinted green by a glass filter over its window. The viewfinder itself is somewhat tinted, to avoid eye-strain, according to the manual. Petri called the VF and RF the Green-o-Matic system (mentioned on the camera's main badge). There is also a brightline frame in the viewfinder; unlike the Canonet, this does not move to give automatic parallax correction. Film advance is by a lever on the top plate (again unlike the Canonet, which has a folding trigger-lever on the bottom). There is a double-exposure prevention interlock, which cannot be overridden. There is a frame counter, in the hub of the film advance lever. Rewind is by a folding crank, with a rewind-release button in the base. Kuribayashi's distictive red-spot badge (on, for example, the earlier Petri 35 and other small rangefinders) is replaced with a much less bold version, impressed in the plastic around the viewfinder. 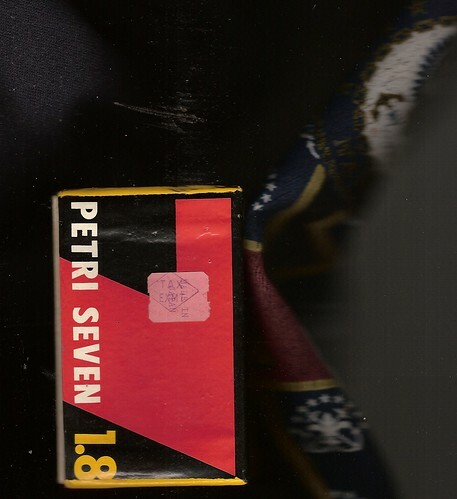 On this camera, it still shows the same sinuous S and small bold K (for Kuribayashi); on the Petri 7s, which replaced the 7 in 1962, the logo has become the name 'Petri' in a circle, reflecting the company's legal change of name. ↑ McKeown, James M. and Joan C. McKeown's Price Guide to Antique and Classic Cameras, 12th Edition, 2005-2006. USA, Centennial Photo Service, 2004. ISBN 0-931838-40-1 (hardcover). ISBN 0-931838-41-X (softcover). p579. ↑ 2.0 2.1 User's manual at Mike Butkus' Orphan Cameras. This page was last edited on 25 February 2019, at 05:07.